The annual meeting of the TENNESSEE MUNICIPAL LEAGUE (TML) was held June 11-14 at the Gatlinburg Convention Center. We enjoyed visiting with our clients and friends at the Ice Cream Parlor. 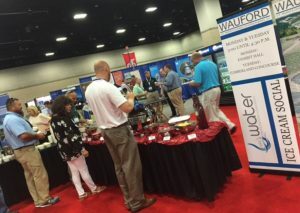 The annual WATER PROFESSIONALS CONFERENCE (the joint meeting of the KY-TN AWWA and WEA) was held at the Knoxville Convention Center in Knoxville, Tennessee, July 17-20. Our Ice Cream Social was another great success and we certainly were pleased to see so many of our clients at this event. A review for Lagoon Treatment Capacity is being prepared for submission. The Automatic Read Water Meter System Phase 2 project is completeand closed out. 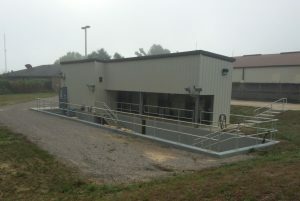 Design of improvements to the Peak Wastewater Diversion PumpingStation is underway. The Capacity Assessment Plan, Sewer System Evaluation Survey Work Plan, Fats, Oils and Grease Control Program, Sanitary Sewer Overflow Response Plan, Pump Station Operation and Preventive Maintenance Program, Continuing Sewer System Assessment Program, Infrastructure Rehabilitation Program, and Information Management Systems are complete and approved by EPA as part of the Administrative Order of Consent. The Capacity Assessment Report is complete and being submitted to EPA. Cleary Construction was the low bidder on the Carters Creek Pumping Station Renovation project in the amount of $651,000. Construction is expected to begin late summer due to timing of pump delivery. Construction for the Holiday Drive and Lantana Estates Water Line Replacement Project, which consists of the replacement of 19,000 L.F. of 6-inch asbestos cement water line, is underway with a completion date of November 12, 2016. At this time, approximately 4,000 L.F. of 18,215 L.F. of 6-inch pipe has been installed. 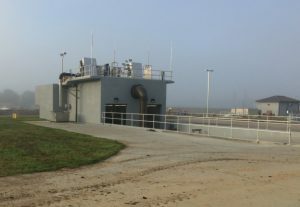 Modifications to an engineering report for improvements to the WWTP are underway to allow project phasing. Work on the Hwy 27 North White Oak Road sewer lines is complete. tank, Fentress County Utility District. The new 200,000 gallon Clarkrange Elevated Tank project, with the low bidder Phoenix Fabricators and Erectors at $610,717, is under construction. The steel erection crew is on site and completion is expected late October 2016. The NPDES Permit renewal application is complete and was accepted. The draft for review is pending. Design of the North Wastewater Treatment Plant Final Clarifiers No. 1 & No. 2 Rehabilitation project is complete and plans and specifications have been submitted to KDOW. Construction of the 1.0 MG Vine Street Water Storage Tank Renovation has been awarded to Preferred Sandblasting of Shelbyville, Tennessee at a total contract amount of $845,700. Work is progressing on schedule and construction of the new air conditioned equipment room is complete. The ARC/SRF project for Lewis County and Hohenwald that extends a 6-inch water line approximately 28,000 L.F. along Summertown Hwy. is ongoing with the Contractor having installed line WL-1. Work is underway on added line work and the booster pumping station. This $557,194.47 project has a completion date of October 2016. The Appalachian Regional Commission recently announced award for the Water System Rehabilitation in the amount of $500,000. Report for a 2016 Community Development Block Grant focusing on Water Rehabilitation was submitted to ECD and announcements are expected Fall 2016. Plans and specifications for Priority No. 3 Phase 7 are complete and have been submitted to the Owner. The U.S. Highway 41A water line project, which consists of approximately 15,300 L.F. of 20-inch water line to increase flow and pressure at the Interstate 24 interchange, in the amount of $1,659,958, is in service and the project is closed out. Design is underway for sewer extension to Farm Credit Services and to accommodate future growth. An evaluation of the Wastewater Treatment Plant and Rate Study have been submitted and are under review by Humboldt Utilities. The 2015 CDBG Project for the Lagoon Aeration System and Sewer Rehabilitation project is ongoing. The Contractor, SDT Contractors, has completed the point repairs and is working on installing the new aeration system with a completion date of December 2016. This project cost is $503,724.50. Humboldt Utilities was awarded a Site Development Grant for a waterline to the Industrial Park. Bids were opened for SRF funded improvements at the Miller Avenue Wastewater Treatment Plant on July 25-bids are under review. A $13.3M Disaster Community Development Block Grant was awarded for five separate projects including Miller Avenue WWTP work, sewer line replacement and rehabilitation, sewage pumping station renovation, and dual South Fork Forked Deer River utility crossings. The Cornersville WWTP Sludge Holding Tank with a bid of $119,000 is complete and closed out. Plans and specifications for the State Route 50/431 Utility Relocation have been submitted to TDOT. The project has been postponed until December 2016. Design of methanol and coagulant feed and storage facilities to enhance nutrient removal is complete and has been submitted to SRF. Plans and specifications for the Snell Branch Sewage Pumping Station are complete and have been submitted to SRF. A report for inclusion in a 2016 CDBG Sewer Rehab project was submitted to ECD and announcements are expected Fall 2016. Plans and specifications for backwash and water supply improvements to the Water Treatment Plant are complete and submitted to the State and Owner. A draft instream monitoring program and bio assessment program that will have to be implemented August 1, 2016 to August 1, 2017 to comply with NPDES Permit requirements is being completed. A nutrient optimization total nitrogen and total phosphorous NPDES Permit effluent limitation proposal is currently in process and will be submitted August 2016. J&M Grading Division, LLC was the low bidder for the TDOT SR 52 Utility Relocation project. Contractor is currently working intermittently. A report for the Monroe Booster Pumping Station Upgrade has been submitted to the Owner for review. A Drought Management Plan has been completed and approved by the State pending City adoption. Bids are scheduled to be opened Tuesday, August 30, for a project providing for the clean out of Polishing Pond No.2 at the Wastewater Treatment Plant. Plans and specifications are complete and submitted to the Owner for 21,000 L.F. of 3-inch and 4-inch water line on Baizetown and Cave Ridge Roads. 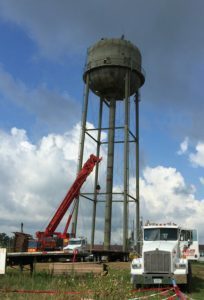 Horsley Construction was the low bidder for Phase I Water Improvements, which include 15,876 L.F. of 16-inch North Transmission Line, in the amount of $965,089. Construction is expected to be complete in May 2017. A Beneficial Reuse of Special Waste Permit Application was submitted to KDOW on behalf of the Owner and specifications are complete and submitted related to the cleanout of the Water Treatment Plant solids lagoon. Construction on the Johnson Controls Pumping Station and Sludge Pump Replacement project has begun with the Contractor having completed demolition and installing pipe. Richland, LLC is the Contractor on the $233,000 project with a completion date of September 2016. A report for a 2016 CDBG Raw Water Intake Improvements project was submitted to ECD and announcements are expected Fall 2016. Technical assistance with the pretreatment program is ongoing. The Local Limits were re-evaluated and submitted to the State for approval. Phase I of the TDOT State Route 128 road widening is under construction. This project includes relocation of water, sewer, and natural gas utilities. Barsto Construction is the Contractor and the scheduled completion date is September 2016. A Community Development Block Grant for water plant improvements was awarded to Quinn Construction in the amount of $271,740. The project has a completion date of November 9, 2016. The main interceptor sewer rehabilitation project is complete and closed out. W&O Construction was the low bidder for the renovation of the 2.16 MGD SBR Wastewater Treatment Plant, in the amount of$2,794,000. Award approval from ECD is pending. A 365 day construction timeline is expected. The $227,116 Main Street Gravity Sewer Replacement Project is ongoing with sewers and manholes installed and in service. Paving remains to be completed. A pre-construction meeting for the 2015 Community Development Block Grant, that will include improvements at the WWTP, was held July 22. Quinn Construction is the Contractor on the project with a low bid of $499,000. The design of a new 1.6 MGD Sequencing Batch Reactor Wastewater Treatment Plant is in process. NPDES Permit Renewal Application is complete and has been submitted. SDT Contractors submitted the low bid for the project to replace an 8-inch waterline on Martin Luther King Drive in the amount of $61,689. The project has a completion date of August 24, 2016. Design of the State Route 21 Utility Relocation project is nearing completion.